The State of Texas confirmed its first Zika-related fatality in Harris County, shortly after an infant was born whose mother recently traveled to Latin America. This marks the second death in the United States. “Zika’s impact on unborn babies can be tragic, and our hearts are with this family,” Dr. John Hellerstedt, Texas Department of State Health Services commissioner said in a statement announcing the incident. Harris County Public Health (HCPH) officials stated the baby girl died shortly after being born. The baby tested positive for the virus and exhibited Zika-linked birth defects including microcephaly, the condition where babies are born with small heads and deformed brains. “We are devastated to report our first case of Zika-associated death and our hearts go out to the family,” stated Umair A. Shah, MD, MPH, Executive Director of HCPH. “While this is a travel-associated case, we know that prevention is key to reducing the risk of Zika virus infection. Harris County officials said the mother recently traveled during her pregnancy to Latin America, where they believe she contracted the virus. In July, Breitbart Texas reported the state’s first case of Zika-linked microcephaly, also a Harris County newborn. As of August 5, Texas reported 99 total cases of Zika. This count includes the two infants with microcephaly from Harris County. To date, all Texas cases stemmed from travel abroad to areas with active Zika transmission. No local mosquitoes in Texas transmit the virus, although the state remains on high alert for that possibility. While most who contract Zika experience short-term mild flu-like symptoms, pregnant women and their unborn babies are most at-risk because of associated birth defects like microcephaly. 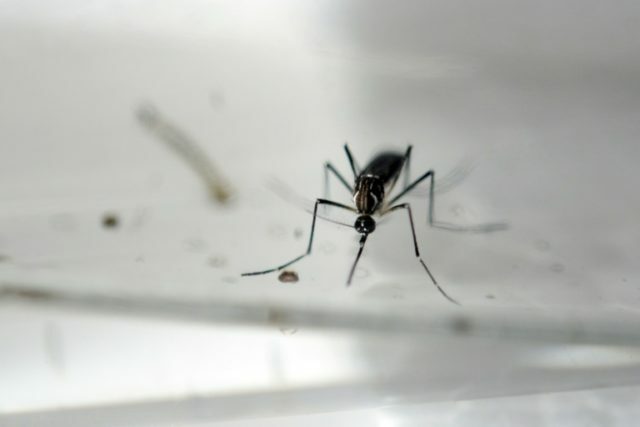 Texas Medicaid announced it will cover the costs of up to two cans of mosquito repellent per month through October 31 for eligible women between the ages of 10 and 45 or pregnant. To receive the free mosquito repellent, eligible women must be enrolled Medicaid, CHIP, CHIP-Perinate, Healthy Texas Women, or the Family Planning program. A doctor must prescribe the repellent and it must be picked up at a pharmacy. Children’s Hospital Pavilion for Women in Houston now houses a new Zika clinic for pregnant women at risk for contracting the disease. State health officials urge Texans to follow simple precautions to protect themselves from mosquito bites such as using EPA-approved insect repellent, wearing loose-fitting clothes, using screens on windows and doors, and removing standing water around the home to avoid attracting mosquitoes. Over the weekend, Governor Greg Abbott released a video with the help of First Dog Pancake to demonstrate these simple precautions and steps to help keep mosquitoes away from the home. He also updated Texans on the state’s efforts to combat Zika to ensure the safety of its population in the event of local transmission. “Keeping you safe is my top priority as your governor,” said Abbott.